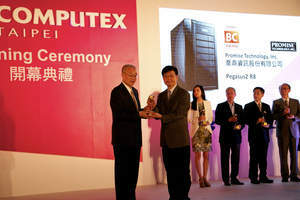 TAIPEI, TAIWAN -- (Marketwired) -- 06/03/14 -- Today at the Computex Best Choice Award Ceremony, PROMISE Technology was presented with the Golden Award by Mr. Wu, Den-yih, Vice President of Taiwan, as its Pegasus2 R8 claimed the industry's top honor as the best storage solution at the event. The Best Choice Awards are judged based on the functionality, innovation and market potential of the products submitted and the Pegasus2 R8 claimed top honors in the storage category. The Pegasus2 R8 is the world's first hardware RAID 5/6 storage solution with Thunderbolt 2, which boasts a staggering speed of 20Gbps, enabling content creators to effortlessly accelerate any 3D or 4K (Ultra-HD) workflow environment, a key factor which led the it to being named the top solution. The Pegasus2 R8 will be on display at Computex 2014 at the Best Choice Award Pavilion (Booth #I0307) hosted by the Taipei Computer Association, at Intel's Thunderbolt Technology Product Showcase (Booth #M0820), and at PROMISE's product showcase (Booth #J0418) from June 3 - 7 at the NanGang Exhibition Center. PROMISE will be featuring its complete product portfolio for the cloud/IT, video surveillance and rich media markers in full scale demonstrations, including the new small form factor Pegasus2 M4 with Thunderbolt 2, the Vess R2000 high-availability NAS for SMB and enterprise IT, and the VTrak G-Class NAS Gateway paired with the A-Class shared storage appliance for broadcast and post production. For more information, join PROMISE at Computex and follow PROMISE Technology on Facebook or Twitter. Computex Taipei 2014 is Asia's largest ICT trade show and the second largest in the world. Entering its 34th edition, Computex attracts over 130,000 visitors, including 38,000 international visitors, and 1,700 exhibitors. Computex runs from June 3rd - June 7th. For more information, please visit http://www.computextaipei.com.tw. PROMISE Technology is a recognized global leader with 25 years of experience in the storage industry. PROMISE has developed its own enterprise-class hardware and software storage architecture, in addition to complete SAN, NAS and Unified storage platform product lines. PROMISE is also committed to providing dynamic software defined storage solutions for vertical markets, including cloud and IT storage solutions, video surveillance storage solutions, rich media storage solutions and much more. With industry leading technology and research and development capabilities, combined with highly experienced global sales and after sales service teams, PROMISE is at the forefront of the industry with the highest levels of customer satisfaction. PROMISE Technology is an ISO-9001:2008 and ISO-14001:2004 certified manufacturer with operations and sales and support teams throughout the Americas, EMEA, and APAC regions providing unparalleled service and support to customers around the globe. For more information, visit: www.promise.com. © 2014 PROMISE Technology, Inc. All Rights Reserved. PROMISE, the PROMISE logo, VTrak, VTrak A-Class, VTrakFS, SmartStor, SuperTrak, FastTrak, VessRAID, Vess, PerfectFlash, HyperCache, HyperCache-R, HyperCache-W, GreenRAID and Pegasus are registered or pending trademarks of PROMISE Technology, Inc. in the U.S. and other countries. All other trademarks are the property of their respective owners. Information regarding products, services and offerings may be superseded by subsequent documents and are subject to change without notice. For the latest information and specifications regarding PROMISE Technology, Inc. and any of its offerings or services, please contact your local PROMISE office or the corporate headquarters.